What is CITES? Why is it Important? CITES is the acronym for the "Convention on International Trade in Endangered Species of Wild Fauna and Flora." This treaty, comprised of 178 countries, was created in response to a resolution drafted by the International Union for Conservation of Nature (IUCN). The purpose of CITES is to ensure that international trade does not threaten the survival of any plant or animal. Approximately 33,000 species fall under the CITES umbrella of protection, approximately 5,000 of which are animals. Proposed species are discussed, and member countries vote if they would like to place the species in one of three appendices (Appendix I, Appendix II or Appendix III). Each Appendix reflects a different level of endangerment and suggests sanctions that should be considered for animals in that category. Appropriate Appendix levels for proposed species are decided at the Conference of the Parties (CoP), held approximately every three years. At this meeting, flora and fauna can be added to Appendices, promoted, demoted or deleted. The category in which the species is placed will determine the international protection it is afforded. 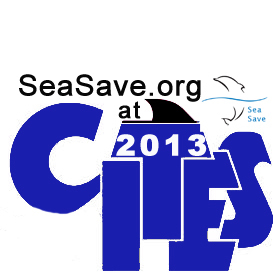 Member countries of the treaty are bound to abide by the laws created by CITES consensus. A common misunderstanding is that CITES is a conservation meeting. While national and international NGOs may apply to participate, voting members are delegates sent by their home countries to represent the national interests of that member country. If the animal or plant being proposed for sanctions represents a high revenue stream or if the specimen is heavily imported into the member country, delegates may be instructed to vote against protective sanctions. The 16th Meeting of the Conference of the Parties to CITES is in progress right now in Bangkok, Thailand, from March 3-14. Of particular interest for Sea Save Foundation is the proposal to add Scalloped Hammerhead Sharks, Great Hammerhead Sharks, Porbeagle Sharks and Manta Rays to CITES Appendix II. This would simultaneously afford greater attention and protection to these species and would allow scientists to collect more reliable data about shark numbers and dispersal. Current arguments against this proposal include the following: a) the collected data does not make a compelling argument, and b) it would be too difficult for customs officials to differentiate fins from protected species vs non-protected species. These queries have been clearly addressed by scientists on site.